Ready to step up your streaming game? The deals gods are looking out for you. Amazon has a Black Friday deal on the Elgato HD60 S, a very good entry level capture device that’s perfect for console streamers who want to go beyond what Sony and Microsoft’s basic internal streaming offers. Right now it's $129.95, which is a saving of $50. If you're in the UK, the Elgato HD60 S is down to £99.99, a saving of 30%. The Elgato HD60 S is only TK on Black Friday, down from $160 all year round. 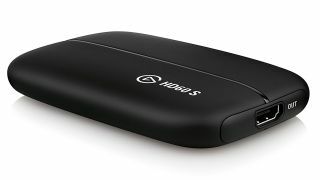 From what I’ve seen, capture cards and external boxes like HD60 S don’t go on sale much - in fact, they can actually be pretty tough to find sometimes - so I’m willing to bet that this is one of the best deals you’re going to get on up-to-date streaming hardware. Not that you should buy it just because it’s cheap. The HD60 S is one of the best capture cards for Xbox One and PS4. It’s reliable, easy to set up, and you can mirror or playback on your PC. We don’t love Elgato’s first-party streaming software, but you can swap it out for OBS or XSplit, so that’s not a huge loss. If you’re ready to get serious about streaming, this is a good first step. Looking for more of the best Black Friday sales? Keep an eye on our Black Friday game deals hub for the best games and gaming hardware offers we can find.